The Department of Theater hosted the Pig Iron Theater Company as Artists in Residence at Colgate from February 20-26, 2017. Founded in 1995 and based in Philadelphia, PA, they are dedicated to the creation of new and exuberant works that defy easy categorization. Why? Well, first off, they are masters in “devised performance.” Secondly, they are Masters. If you missed them you must seek them out elsewhere! Devised performance has foundations associated with Lecoq pedagogy, and includes channels of explorations in movement, improvisation, and ensemble creations. Devised performance advocates creativity as dialogue rather than monologue; actors and directors work together in an improvisational setting to create characters and plays wholly “owned” by the ensemble. Response by Pig Iron: “One important aspect about Theater is the sense of ensemble it creates and that every person in the room is of great value. A lot of the time spent in both rehearsing the show every night along with singing together or stretching together or running around the room together and visualizing the room as a group of people serving something bigger than us rather than a bunch of individuals each playing their part. Response by Pig Iron: “I think the thing that has been really exciting for me has been to add the craft of performance, to the process of writing and process of making things. I wanted to be a writer when I was in my young twenties, I thought I was going to write, you know, stories and novels, and I was terrible at it. And it was for this reason that I hated the solitary practice of sitting down but I really loved playing with words and I love crafting things and just being alone and not being with people giving me, you know, information and things to play with. So, I would say the process of figuring out how to write and then trying to decide what is important to say and what is relevant has been the great ongoing question every time you go to make a piece. Every time Pig Iron makes a piece they ask big questions and the piece comes out of those questions, the DNA of the piece rests in like: “Well for this, we have to do this, we have to, you know, have this kind of style, this kind of vocabulary” and so the piece grows from these really hard questions. If you’re making a piece on things you know about or you feel certainty about, then it may not be a good piece. We always start with questions to which we don’t know the answers yet. We are actively working out answers to our own issues and problems through performance and experimentation. 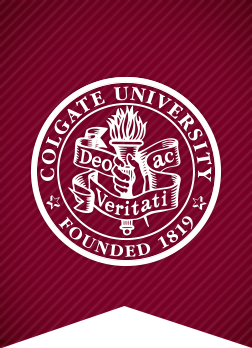 Colgate University thanks you for your contributions! The Pig Iron Theater Company engagement is funded through the Mid Atlantic Tours program of Mid Atlantic Arts Foundation with support from the National Endowment for the Arts. Additional support is also provided by the Christian A. Johnson Foundation. Colgate University’s Arts Council, Department of History, Department of Art and Art History, and the Department of Theater also provided generous support.